The author is Nigerian, the context is mythological, the narrator a small boy wandering warily through the African Bush, but the subject of the passage, our subject, is a 28-year-old American pop star who, just now, is coiled in the corner of his near-empty new loft in Soho, New York City, watching a videotape of genuine African dancers in a genuine native village moving to genuine African drumming. Our Scottish-born subject happens to have a record out with the same title as Tutuola’s novel, happens to have a collaborator (see Eno story when you’re done here) just back from a music safari in Ghana, happens to have seen the light beaconed by the civilization that sprung up at Oldavi Gorge, right under Dr. Louis Leakey’s nose in that neat film they show in high school. David Byrne will. Talking Heads probably will. Brian Eno, their producer, most certainly will — though perhaps not in their company. The focal point of all this movement is, of course, their movable Afro-funk-psychedelic feast. Remain In Light. Easily the most exciting popular effort of 1980, it was also the best dance disc since Parliament’s Funkentelechy vs. The Placebo Syndrome and one of those rare pop records that jazz and modern classical listeners didn’t turn up their noses at. 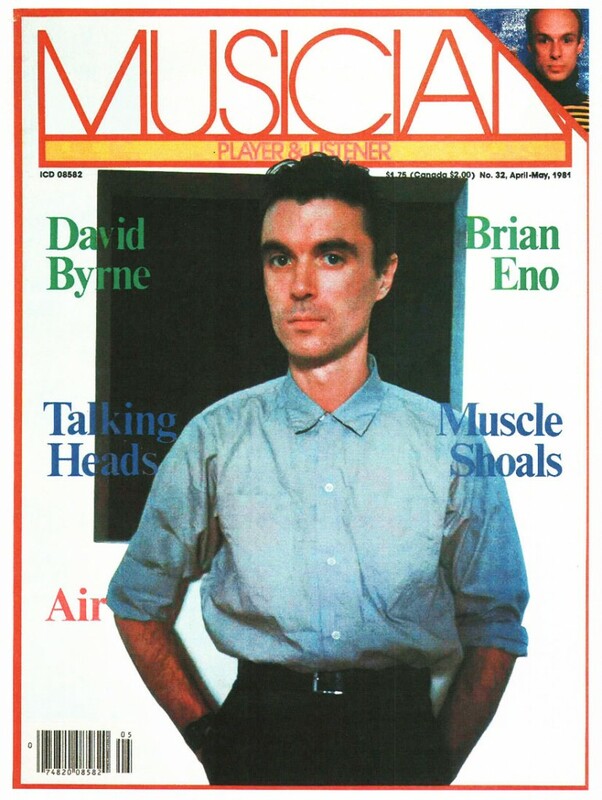 Most importantly, Remain In Light signalled a musical, emotional, and philosophical change within Talking Heads — most notably, within the head Head, David Byrne. One, two, three. From the first three beats of the African drum that literally and symbolically announces the record, we know everything will change its shape: the impetus will become polyrhythmic, not straight Beat; the vocals will be chanted, preached and talked layered and woven in circular patterns, not whooped and shrieked in solitary confinement; the tone will be affirmative and spiritual, not sardonic and paranoid; the parts will be interlocked and communal, not autonomous and individualistic. In time, the music would explode the familiar quartet of Christ Frantz, Tina Weymouth, Jerry Harrison and Byrne (hey, remember the ’70s?) into a nonet featuring P-Funk freeboardist Bernie Worrell and ex-Bowie, ex-Zappa guitarist Adrian Belew. And don’t mistake that red-splotched cover of Remain In Light for just another groovy graphic, those Heads are wearing face paint, those Heads are wearing techno-tribal masks. The missing link in our pilgrims’ progress from Fear Of Music to Afrunkidelica was Byrne’s collaborative work with Eno, My Life In The Bush Of Ghosts. It was to precede Remain In Light into the market-place — Eno calls it a “laboratory” for that record, Byrne a “blueprint” — but events conspired to hold back its release until this March. On it we can hear the rising tide of pan-ethnic stylings, a growing concern for what idealists call the World Village: Algerian Muslims chant the Qu’ran. American evangelists testify Georgia’s Sea Island singers spin a folk tale, a Lebanese mountain singer calls from the hills, an exorcist goes after Jezebel on a New York radio station, an Egyptian pop singer slithers through a maze of percussion, an “inflamed caller and smooth politician” are stolen from a radio call-in show and reduced to electronic gibberish. These are the “found” voices on the record, the ghosts, if you will; Byrne and Eno, and a small army of percussionists, supply the accompanying rushes of rhythm and the washes of color. It’s funny, it’s arty, it’s high-tech ethno-pop. And you can dance to it. Talking Heads, talking bodies, talking spirits, talking drums: David Byrne is talking about the things that matter to him these days. The light of this one — and only this one — is slowly pulled away by the clock, leaving his unlit loft darkened. Byrne speaks slowly, pausing for thought after every question, every sentence at times. His voice — so jolting and wounded on Talking Heads’ first three records, so messianic on Remain In Light — is barely above a whisper. He talks as a young man with an old man’s soul might talk. BRESKIN: When did your fascination with ethnic musics begin? BYRNE: Oh, I started listening to it when I was in high school, getting records out of the library. But it wasn’t until about three years ago that I started looking for pop records from other parts of the world. I was interested if there might be some sort of merger of forms happening. Perhaps there were groups somewhere playing in traditional styles using electric guitars or whatever. And sure enough that does happen. So I looked for African pop records and Brazilian pop records, that sort of thing. Also, some Islamic music, and I’ve also listened to Indonesian music — which has some good rhythmic stuff — and some real nice Vietnamese records. But the African music was the easiest to relate to right away. BRESKIN: Because of the rhythmic impetus? BRESKIN: In terms of the funk on this side of the ocean, I would assume George Clinton’s Parliament-Funkadelic thang caught your ear. BYRNE: Uh-huh, most definitely. But I started out listening to some of the older stuff: James Brown, Kool & The Gang, Sly Stone in the late ’60s and early ’70s. BRESKIN: I don’t suppose your exploration will stop with the Afro-funk-psychedelic fusion of the last two records. I hear you’re going to check out some Gamelan music in Indonesia. BYRNE: That’s right. I’m going to Bali after our tour of Japan. A guy contacted me who had been doing some recording in Hong Kong and had been to Bali and had contacts for me. It seemed like a good opportunity to check the situation out, to work with some musicians over there and see what might develop. It’s not like that music is my #1 favorite or anything, but it’s a chance to check it out. BRESKIN: In the meantime, you’re plowing ahead with your work in visual art forms — photography and video. At one point, wasn’t your visual art more developed than your music? BRESKIN: Do you feel you bring the same rationalistic rigor to your art that the mathematician or systems analyst brings to his work? BYRNE: Yeah, I do tend to look at things that way sometimes. It’s useful, it amuses me. But the final decision on whether something stays or goes is usually based on some sort of intuitive thing, not on whether it fits into a system or a concept or a theory. It has to sound right. BYRNE: Uh-huh, but it doesn’t have to be such a split. It’s not so hard to use both at the same time, or to use either one when the other one fails. If one doesn’t seem to be leading anywhere, use the other one. For instance, if I go into a studio with nothing planned, I could piddle around on my instrument to see what happens intuitively. Now there’s a chance I might get something, but it seems like there’d be more chance if there was some sort of process I was using to construct the piece. If I formulate a structure, then I have to be intuitive within my restrictions — and that can be more productive. A lot of people who compose or dance or whatever go through this process in their heads; they just don’t externalize it, or talk about it. BRESKIN: Using strict formal parameters for a project doesn’t necessarily mean it can’t open up as you go along? BYRNE: No, as long as you don’t let it block you from keeping your ears open to what’s happening as the project develops. Sometimes things can happen in the opposite way: you can start with a very loose concept or notion or a direction and then you just improvise off of that. Then you go back and look or listen to the improvisations and pick out the interesting bits and formalize those. You might find an interesting pattern, then pick it out and learn it. I just did a videotape out on the west coast that involved me dancing in it, and that’s the way I did the rehearsals: improvising within a general framework in front of a little port-a-pack video camera. I’d look back and pick out the good parts and just do those moves again. BRESKIN: Sort of like visual bio-feedback? BYRNE: Yeah, only. I’d have to walk around to the monitor later. I’d review it and say, “That was a good move, that one really connects. It’s just abstract looking enough, it doesn’t look like I’m just miming something.” That was the kind of thing I was looking for. I would pick out moves that would fit into that category and do them again. BRESKIN: Do you enjoy dancing? BRESKIN: It’s a curious phenomenon, how dancing to a given piece really affects the way one listens to it, or hears it. BYRNE: Yes. I can show you some tapes of dancing that illustrate that pretty well. I have one of African dancing, where the music is really pretty fast rhythmically, but their dancing looks like it’s in slow-motion. In fact, you’d be convinced it was in slow-motion until you see somebody walk by in the background at normal speed. And so that dancing can make you hear a slower rhythm happening inside — or around — the faster rhythm. Likewise, I have a tape of some dancers in L.A. called the Electric Boogaloos, who do a lot of ticks, little jerks for just a second. [Demonstrates by moving shoulder and arm in minute robot-like fashion.] This makes you hear other beats, off-beats, that you might not have paid much attention to. BRESKIN: Dancing also activates the listener, makes him less of a consumer and more of a participant, more completely involved in a mind-body-spirit sort of way. BYRNE: Yeah, I think when people dance they immediately eliminate that mind-body separation. There is an open flow between them. And in a way, it’s not even necessary to dance sometimes when the music is real funky, because you hear it almost as much with your body — even if you’re not moving — as with your ears. So your own rhythm interprets it. BRESKIN: The participating listener also might help turn the music from the more passive realm of art-for-consumption to something more like ritual or social event, as with so-called “primitive” cultures? BYRNE: Uh-huh. If you call the kind of music we’re doing now “non-hierarchical” then performing it for a community in a way describes the way a community can be organized, that it can work without having that kind of hierarchy. So the music becomes a sort of aural demonstration. BYRNE: Yes, as a metaphor for a social system. It doesn’t even require thought when you hear it. It communicates more directly. People might hear a piece of music that’s organized in a particular way and really enjoy it — because that’s the way they’d like other things to be organized. Maybe it’s the kind of social organization they’re comfortable with, so the music really connects to them on some sort of deep level. BRESKIN: That’s rather idealistic, considering our society. BYRNE: Yeah. [Laughs, long pause.] Yeah, it does sound pretty idealistic. Yet most art shoots for the same sort of thing: it comes to work as a metaphor for something else — a way of organizing people socially or a way of looking at the world. I guess if you look at it this way it’s not so idealistic; most times, music and art aren’t necessarily trying to change the world so much as just demonstrate a structure that can exist, and does exist, that people might be able to relate to. BRESKIN: Given the direction of your music and the emphasis on community, how does the Talking Heads community function? I don’t suppose you could call it a non-hierarchical or democratic one, since you and Eno have been most responsible for the direction of the music. BYRNE: The problem is that people tend to confuse “non-hierarchical” with “democratic.” They equate the two. So it’s one thing or the other: there’s either a dictator and a bunch of people being bounced around, or, everybody’s equal. But there’s other ways of working things that work quite well. Like in Japan, there’s a definite hierarchy, but no one feels put-upon. The people at the lower end of the hierarchy feel that’s their place. The general attitude is: that’s where they belong and they are to be respected for it, respected for their ability to fit into their niche. BRESKIN: Yeah but David, in the wrong society that has dangerous implications. Or even in the wrong pop group. BYRNE: Well it works in Japanese society because of their respect system — a person is respected to the extent he fits into his proper place. I think other things can work this way. Different people are good at doing different things — so they’re definitely not equal, but they may be mutually respected by one another for doing whatever job it is they do. The tricky part is being mutually respected. It’s difficult to make it work, but I think it’s possible. BRESKIN: Hell, if you’re patterning your music from the spirit and sensibilities of African music, maybe you’re patterning the T. Heads after African society? As I understand them, African tribal societies are not exactly “democracies” in the western sense. BYRNE: And I feel that that kind of thing is a shame, because it takes attention away from the music and things that I think are much more exciting than the difficulties of keeping a band together. It’s a real shame, it brings them down to the level of gossip. Anything I say can get reduced to grist for the gossip mills. BRESKIN: Now what about what you’ve called the “rock musicians’s capitalistic way of thinking” in the way your music works now. Could you flesh that out a bit? BYRNE: A guy named Max Weber wrote a book in the ’20s I think called The Protestant Ethic and the Spirit of Capitalism. He was attempting to explain how a peoples’ spiritual foundations lead them to a particular economic way of life, how their religious and moral upbringing leads them to a social and economic attitude. I think this is true for rock musicians as much as anyone. They’ve grown up in a society that values competition, the whole dog-eat-dog beat-out-the-other-guy kind of thing. So they’re bound to play music in the same way: trying to out-solo the other guy, trying to play louder than the other guy, et cetera. All that’s very different than the kind of music we’re playing, where you have to leave a lot of holes in what you’re playing in order for the other parts to be heard, where the whole thing doesn’t take off unless you can hear lots of different people’s parts popping in here and there. This is not to say we negate ourselves as individuals, but that we get something by restricting our individual freedoms that we couldn’t get otherwise. The whole feeling this music generates for me — the whole community of interlocking parts — is totally different than what rock does. Presently, I don’t feel I have any connection to rock and roll. In a lot of rock music people tend to play all the time, or at least as much as they can get away with. BRESKIN: Didn’t you go through a phase of basic American ego-laden individualism, that sort of playing? BRESKIN: Is your current music an arrival or a direction or perhaps only a stage? How do you think about it? BYRNE: [Puzzled.] I don’t know. I don’t know what we’re gonna do next. I guess it’s a direction. BRESKIN: Do you have any fear that you might find yourself either duplicating or regressing from Remain In Light? BYRNE: Not really. I’m ambivalent about all the pressure to come up with something new. BRESKIN: Seems reason enough to explore other media. BYRNE: Well, I have been doing work in video. I did a project with Toni Basil of the Locker Dancers, and I helped out Bruce Conner with a couple of films to music from Bush of Ghosts, and one I did myself. All this occupied me for a good while and I spent a lot of money on these things. And I’ve been doing these photos [points to huge, warm-toned prints lying on the floor] for the past few years that I’ve only just had blown up. BRESKIN: What kind of parallels do you draw between your music and your visual art? BYRNE: The method, the working process can be real similar. I don’t really know what the visual arts give me that music doesn’t, or visa versa, I have noticed that they tend to feed back to each other, one into the other. BRESKIN: I know you used to do copier art with Xerox machines or whatever while at Rhode Island School of Design, and I wonder whether there’s any connection between that activity and incorporating the “found” vocals in Bush of Ghosts or your musical posture in general? BYRNE: I did copier art because I wanted my work to be easily accessible and not available only to the few people who could afford it. I also didn’t want it to have that “aura” that fine art in galleries has — you know, don’t touch ’cause this is precious stuff. Yes, a lot of that attitude carried over to the way I approach music. I didn’t go into music to create something only a few people would like. I didn’t try to make it incredibly commercial either, just not precious. As far as using the found vocals as “copies” of something, I’ve never made that connection myself [laughs] but maybe that’s true though. I’ve always felt there’s more to something than exists on the surface. Even something like a landscape painting, the way in which it’s done might make it about a lot more than just a landscape. Might be a whole way of looking at the world. Or take an ordinary, literal set of lyrics about a subject everybody knows. Real mundane, like a love song. But there are a whole lotta ways those lyrics can be dealt with: phrasing, the choice of an odd word here or there, the texture of the music, the rhythm make it something much more than just two lovers. BYRNE: I got that right off the radio. That’s exactly what the guy said, so I didn’t change it. It sounded too nice the way it was. It sounded much sadder that way. BRESKIN: I know the incessant “And the heat goes on” chorus in “Born Under Punches (The Heat Goes On)” was lifted from a New York Post headline. And the four verses of “Once in A Lifetime” were taken right out of the mouths of preachers you’d heard. How much do you use found materials in developing your ideas and lyrics? BYRNE: On and off a fair amount. Not all the time. Many times found materials are just a jumping off point or a way of getting some inspiration. They may put me in a frame of mind I wouldn’t otherwise be in, and once I’m there I can write the rest of the lyrics myself. BRESKIN: Hey, I mean Picasso put news clippings into his African-influenced art, no reason why you shouldn’t. BYRNE: [Great laughter] Well the thing I like about using something like that is that the listener doesn’t need to know that phrase came from a Post headline for it to work in the song. If you start working on songs where the listener has to be privy to inside information, you get yourself in trouble. A lot of modern writing refers to other works for instance, and if you don’t know them, then you’re really left out in the cold. But I still think you can have stuff that refers to other things and comes from other sources, as long as it works by itself — as is — first. The other stuff is just icing on the cake. BRESKIN: Nor does it seem necessary to explain to your listeners that Remain In Light is based on African rhythms and sensibilities, yet you wrote a letter to all the critics explaining this very thing. How come? BYRNE: Because I wanted to have more interesting interviews. It was my way of saying, “These are the things I want to talk about.” I thought the letter was a way to push the critics in that direction, that they’d write more interesting reviews. BRESKIN: Don’t you think a helluva lot of the critics might have taken the record as a plain, ole funk album if you hadn’t indicated where all this stuff was coming from, including which books on African art? BYRNE: I can’t tell if that would have happened. Could be. I wouldn’t have been surprised. As it was, I wasn’t surprised by the favorable press it got because when I finished it I thought, “Gee, this is a good record … I think.” But I always felt wary, I thought maybe they’re all gonna jump on us for this — for doing something we’re not supposed to be doing. [Laughs] Now if they all had hated it, I guess I might think twice about it. BRESKIN: Alright, David, how about the White Man’s Burden? BYRNE: Hmmm, what is that exactly? Is that where the white man’s burden is to go among the heathens and convert them to Christianity? BRESKIN: Yes indeed, but I’m talking about the modern musical equivalent. The white man goes into the “primitive” culture of Afro-America or Africa or Brazil and extracts the black music — “improves” it to continue the metaphor — for a white audience that won’t listen to it or go hear it played by black people. Or as Hugh Masekela put it, African music won’t catch on in the States until some producer gets four British boys to learn Swahili. BRESKIN: Have you been drawing an integrated audience to your concerts? BYRNE: It’s real slow for that to happen. There were a lot of Latin kids at our Central Park show. It’s happening a little bit, but a lot less than we would like. I’ll be disappointed if it doesn’t begin happening more. A lot of it has to do with radio airplay; it would help if we got played on a station like WBLS [a N.Y. soul station]. BRESKIN: ‘BLS plays white “trash” like Peter Allen and Devo, but no room for Afro-funk? BYRNE: Sure, sure. Maybe they just didn’t go for the stuff. BRESKIN: Certainly the new record has even less of a chance for airplay. In any case, how did you run across Amos Tutuola’s novel, My Life In The Bush Of Ghosts? BYRNE: We had run across references to the book in other books on African culture — a lot of which were very scholarly — and I finally found it at City Lights Bookstore in San Francisco. Previous to that, I just thought, “Gee, what a great title.” And the book didn’t disappoint me, it was all you’d expect from a book with that title. BYRNE: Yes, that’s a very nice quote. I think I understand what that means. I feel less afraid of many things now, feel more confident. And I think the music was important in that it demanded a completely different attitude. The anxiety of my lyrics and my singing didn’t seem appropriate for this kind of music; this music is more positive, though a little mysterious at the same time. So it was important that I wrote lyrics that also had these qualities. BYRNE: It was a matter of writing from a different part of my personality, one that didn’t come out much in our earlier stuff. Peoples’ personalities have more than one facet. Gee, the audience must be fair and let the artist deal with more than one side of his personality. I know this can be tricky in the music business; people get used to a person’s songs being from one point of view and then they identify him as such. They tend to identify the actor with the part he’s playing. I mean: the villains of soap operas have been attacked on the street for being so rotten. But most people do have more than one side. BRESKIN: Sometimes the problem for listeners is deciphering whether the personality the artist presents is truly himself or herself, and how much is unadulterated affectation. Take the U.S. version of punkdom, for instance. BYRNE: Yeah, only now perhaps in some of the “surf punk” bands in L.A. do you find punks who are really punks: Mean as Hell, and not just the creators of an interesting persona. BRESKIN: Do you think of the voices on Bush Of Ghosts as ghosts? BRESKIN: Which in a couple of cases intersect with current political experiences, like with the “Unidentified indignant radio host” railing against our lack of nerve in the you-know-what crisis and on the other side of the coin, you include Algerian Muslims chanting Qu’ran. Where did you get the “Unidentified exorcist” vocal to take Kuhlman’s place? BYRNE: Right off the radio. It was a phone-in show, people called in to have this guy drive off the evil spirits. There’s another guy in California who has you put your hands on the TV screen and he puts out his hands to touch yours and heal you through the TV. BRESKIN: Can you imagine yourself in a similar role? BYRNE: Helping to heal people? Preaching? Yeah, in a way. I get a lot of inspiration from the evangelists one hears on the radio throughout the U.S. I think they’re dealing with a similar aesthetic; in the more exciting preaching I think they’re going after a thing similar to the music. But I’m not very direct about it though. I like to plant just the seed of an idea in someone’s head rather than telling him exactly what I think. BRESKIN: With a lot of those testifyin’ preachers, there seems to be a contradiction — or a tension — between what they’re actually saying and the way they’re saying it. BYRNE: Yes, sometimes there is. Sometimes their delivery is real ecstatic, but what they’re saying is so conservative and moralistic. It’s hard to reconcile the fact that these guys are going absolutely berserk while they’re telling everyone to behave themselves. And they’re madly raving, jumping all over the place. In that kind of preaching — like in a music piece — as much is said in the delivery and the phrasing as in the words. What’s important isn’t what’s literally being said. BYRNE: Well yeah, because I don’t completely understand what I’ve done. I have definite ideas about which phrase is right for a line and which is not, but I couldn’t tell why. Some of my choices don’t make sense in any logical way, I just have an intuitive sense about them. Only later, after the critics have explained it all to me or enough time has gone by, do I have a general idea of what I was trying to say. BRESKIN: Did you find that the pieces were writing you instead of visa versa? BYRNE: Yeah, I find that’s true with a lot of music. It’s generally thought it’s the singer who puts the emotion into the song, but I think most times it’s the other way around — it’s the music which brings the emotion out of the singer. A piece of music, if it’s exciting, demands a certain response from the vocalist, and the music brings out those emotions. BRESKINCIAN: Now that some time has gone by, how do you feel about them? BYRNE: I still think my voice is a little shrill when I talk or preach or whatever. That could be improved; it needs to have a deeper, richer quality, and I need to stop clipping my words and phrases as much as I do. Gosh, what about the words? I know you’re thinking. I still haven’t tried to figure them out. But they work as I intended them to: they have that implied religious, spiritual feeling. Implied, but not stated. I wanted to get a spiritual ambience in the words. BRESKIN: Tom Wolfe’s great phrase for the 70s, ‘The Me Decade and The Third Great Awakening” somehow got shortened and secularized into just “The Me Decade.” But it seems your new emphasis on spirituality is very much a part of our society’s great awakening. BYRNE: Yeah. I’m part of the same society so I’m probably part of the same phenomenon. The fact that our music implies a different kind of social order was sort of a way out for me, a way out of all the predicaments our society has gotten itself into. It’s made me optimistic about things, it’s been very rewarding to see how things work out on a musical level — we’ve achieved more by collaborating and cooperating than we could have achieved by everyone asserting their individuality. It’s exciting. BYRNE: Yes, and one of the things that was so exciting was that it wasn’t just the theory that was good or moral, but that everyone shared in the ecstatic experience when it worked. It wasn’t like we all got together to build a house or anything; working together was its own reward. And the reward was spontaneous. This music has helped me, helped make me optimistic, gave me faith in human beings a little bit; whereas, if I was just to read the headlines everyday, I might write really nihilistic songs. BRESKIN: You couldn’t write another Buildings And Food record if you tried? BRESKIN: Don’t worry, we won’t cast you as the Jerry Falwell of Afro-Funk. But on those first three records, you were writing lyrics from all sorts of different viewpoints, contradictory or otherwise. I mean: there were so many points of view, it was almost like Value Relativism — nothing is better or worse than anything else. In retrospect, wasn’t this a bit of a cul-de-sac for you? BYRNE: In a way, yeah. Because if you get too far into that, then you start thinking of all the possible ways of looking at something and you’ll never be able to make a decision about it. For instance, let’s say you’re driving down the street and see a billboard, and you try to decide: should that be there or shouldn’t that be there? There’s so many different ways you can look at it: you could say it’s an ugly object obscuring nature, or you can say it’s a beautiful object because it says so much about our society. In the process, you’ll never be able to make a decision. You can reason and reason. Which is fun, but it’s mental masturbation. It’s fun, but you can get stuck after awhile. I think I’m out of that phase. I think in a way I was driven into it because people tended to identify me by the songs I wrote, and say, “That’s what he’s like.” So I thought, “O.K., I’ll show ’em, I’ll write one from the opposite point of view!” And so on. It was a challenge. But I’ve stopped doing that now. BRESKIN: How has it been working with Eno? BYRNE: Fine, fine. I don’t know what I’ll do in the future though. We have tentative plans to work on another record together. I don’t know what it would be like. We didn’t even know what Bush Of Ghosts would end up like when we started. I was pretty excited by that project the whole time I was working on it. The whole record, like Remain In Light, was composed in the studio. That technique eliminates the problem of trying to get a texture, a sound you’ve developed while rehearsing, onto the tape. Instead, by composing in the studio you get the sound first and then decide where and how you can fit it in. Once you’ve got it on tape you can never lose it — you don’t have to try recreating it again. This entry was posted in Interviews and tagged Brian Eno, David Byrne, Talking Heads by admin. Bookmark the permalink.